I was experimenting around 2000 with various alternative seven circuit patterns, both by drawing them on paper and at the beach with a stick. I defined the cadence of the pattern as the characteristic sequence of varying distance to the centre while walking. I assumed that, although concentrating on keeping the path, one would be aware of the changes in visual distance to the centre: Sometimes you are so close and then the path takes you further away from the centre again (e.g. from circuit 7 to circuit 6 and 5). How does that feel? Basically, the conclusion of my experiments was that other patterns were either unpleasant or boring, which made clear to me how special the sequence of circuits in the classical labyrinth pattern is. But what makes the pattern/cadence so special? For my analysis I devised a graphical representation of this cadence, like staff notation: I numbered the circuits outside-in, like shown above. The sequence of the circuits when walking the path is: 3-2-1-4-7-6-5-8. 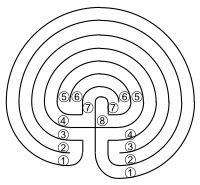 This shows more easily when you fold the labyrinth like a fan (turn the right half anti-clockwise around the centre). 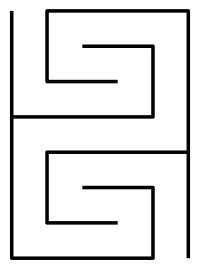 The resulting graph resembles the well-known Greek Meander ornament, with two connecting meanders. The cadence is depicted in an XY-diagram. Vertically are the circuit numbers: the higher you get, the closer to the centre. Horizontally are the consecutive turns from one circuit to the next. The red squares depict the sequence of circuits while walking the path. 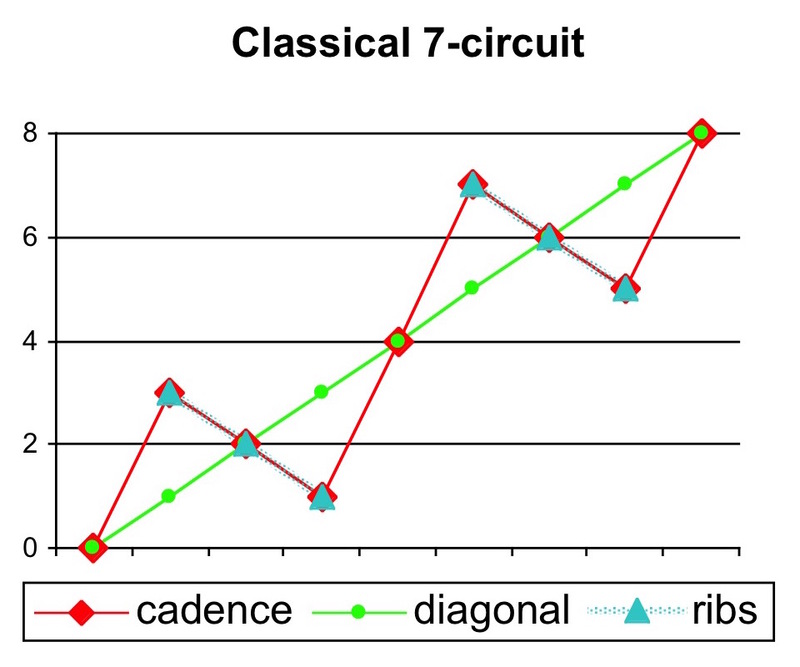 Relating the red line to the green line shows the repeating symmetry of the cadence. This is called self-duality: moving inward or outward has an identical sequence. 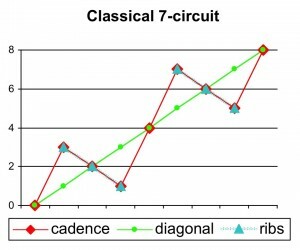 The cadence is even doubly self-dual around circuit 2 and circuit 6, as is illustrated by the blue ribs. To my opinion, this very even but not trivial rhythm is one of the reasons why this type of labyrinth has been used for so many centuries. It is a gentle “rocking” movement that is bodily predictable (feeling safe), but still moving you around and offering a kind of stretching and unstretching of your perception of reality. In my research I also analysed the Christian-inspired Chartres labyrinth pattern. That labyrinth pattern is also doubly self-dual, but completely different in intention. At the 2001 Gathering of the Labyrinth Society in Atlanta, Georgia, I gave a presentation on my findings. My slides can be downloaded in this pdf. My article about it was published in the Journal of Mazes and Labyrinths Caerdroia (nr. 31).